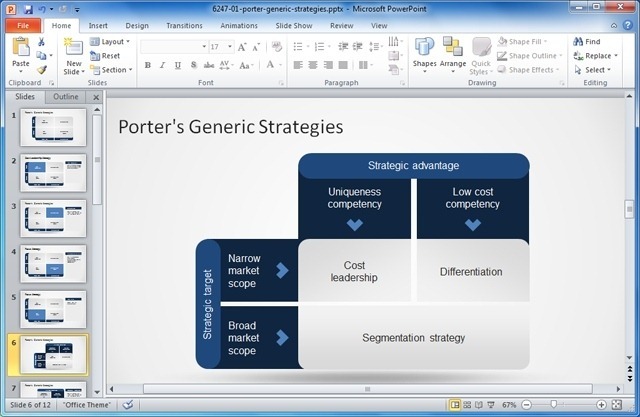 When it comes to competitive advantage, Porter’s Generic Strategies act as a footprint for forming an effective strategy to enhance the scope of a business to achieve desired results. The three general strategies of Porter’s model are used for achieving and maintaining a competitive advantage against competitors. A brief overview of these strategies is given below. 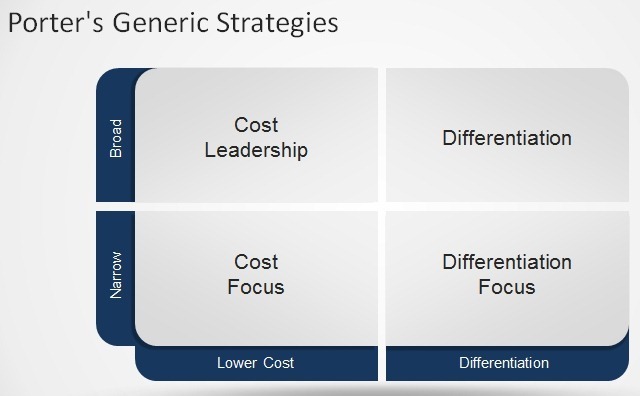 The cost leadership strategy can be effective in setting up barriers to entry for new businesses and may result in competing out existing competition. 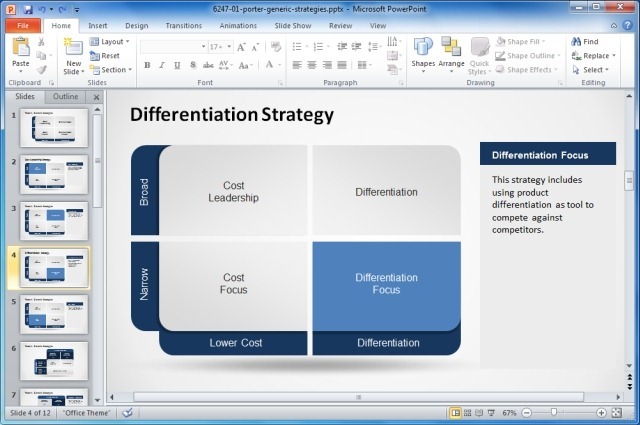 This strategy includes using product differentiation as a tool to compete against competitors. In such a case companies look for satisfying specific customer needs to win over clients. Such a strategy is appropriate to target customers which are not price conscious, where the market is saturated or where there is room to earn profits by targeting customers with specific needs. For example, let’s assume that a tooth paste manufacturer comes up with a product designed specifically for smokers, with a promise of shiny white teeth. Considering the high number of smokers in many countries (in recent years), this may be a good method of selling a product by catering for a need that competitor businesses may not be fulfilling. Hence, by using product differentiation a company may be able to win market share. In some cases product differentiation is actually a matter of creating a perception which may help sell a product. Customers who buy such products may not be price–sensitive, (e.g. customers looking to buy environmentally friendly products or products with more organic ingredients). This is not exactly a separate strategy, as it emphasizes a business’s need to choose between cost leadership or product differentiation. The focus strategy implies the need for a business to focus on a specific market niche, be it with a broad or narrow scope. However, it is not merely enough to provide a product for a specific market niche, as the business must ensure that the needs of the market niche are catered for by providing a product that valuably contributes to the market segment, such as by providing customers with low-cost products that satisfy their specific needs. 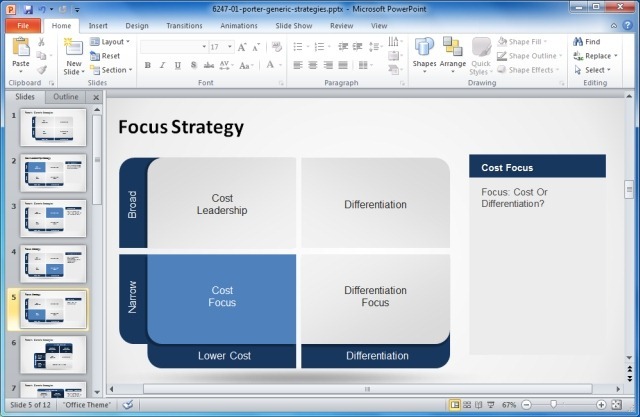 This is a PowerPoint Template for making a diagram, mind map or presentation on Porter’s Generic Strategies. 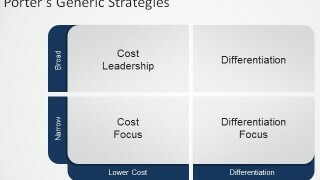 The different slides in this template provide the user with a sequential mechanism for mapping out the 3 different strategies that can be applied for a product so that you may be able to explain the pros and cons of each strategy in a presentation or describe it in the form of diagrams. 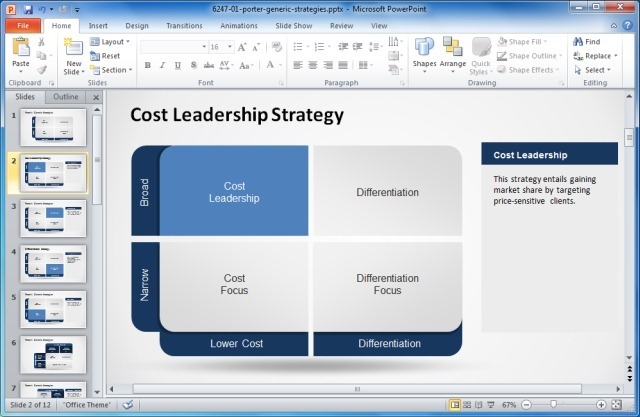 If you want to make awesome presentations showing Porter’s matrix then you can use our Strategy PowerPoint templates. Tags: Analysis Templates, Business Plan Template, Business PowerPoint Templates, Diagram Templates, Porter's Generic Strategies, Project Planning, Strategy, Templates.